It's been a while since I took part at the Waiter there is something in my ... blog event, organised by Andrew, Johanna and Jeanne. This month's event is hosted by Jeanne, who has chosen the Cucurbitacae family as a theme, or if you want a more poetic title, For the Love of Gourd. I've been featuring quite a few pumpkin recipes recently on my blog - pumpkin and flowering quince jam, pumpkin and ginger jam, pumpkin and nutmeg soup, to name just the last three. But I wanted something more mainstream this time, so I baked a pumpkin and ginger loaf, or a teabread. This pumpkin loaf is somewhat different, as it uses grated raw pumpkin instead of cooked pumpkin purée. It's a slightly modifying recipe from BBC Good Food (November 2002). When I baked it few weeks ago, I had run out of those delicious Buderim ginger nibbles that you can buy at Lakeland stores in the UK. If I had had them at the time, I would have certainly thrown in a generous handful of them, for sure.. Mix melted butter, honey, whisked egg and grated pumpkin in a blow. Fold in the flour, baking powder and ground ginger. Spoon the batter (it's quite heavy) into a buttered and lined loaf tin, sprinkle with demerara sugar. Bake in the middle of 180 C/350 F oven for 50-60 minutes, until the cake is golden brown and nicely risen. Cool in the tin for 5 minutes, then remove from the tin and cool completely on a metal rack. Nämm-nämm! I love pumpkin and ginger combination! I'm going to try it ASAP! this looks yummy! i found this year that the pumpkins i carved tasted of absolutely nothing, so didn't use the flesh. i will go out and buy some more for your delicious tea bread... i can already smell the spices invading my kitchen! Thanks, Pille, for a good idea. I'm thinking of adding golden sultanas to my loaves when I make them this week. BTW did you save the pumpkin seeds? Orange pumpkins are hard to find here in Tartu. This really sounds (and looks) great. I'm always looking for lovey tea loves to prepare for the holidays--this one is going on my list! Johanna - I guess even tasteless pumpkin would have worked here - giving texture and moisture - as most of the flavour comes from ginger anyway! Andrew - I'd prefer candied ginger in this one, I think it'd go better than raisins? ChichaJo - trust me, you can so feel the seasons here. I don't like late autumn - it's dark and grey and somewhat depressing. Cannot wait for the snow!! Pene - you're welcome! Orange pumpkins are hard to find here in Tallinn, too, though there are couple of grocery stores that irregularly stock them. And then there's the market, of course. Jeanne - thank you for a great WTISIM theme! 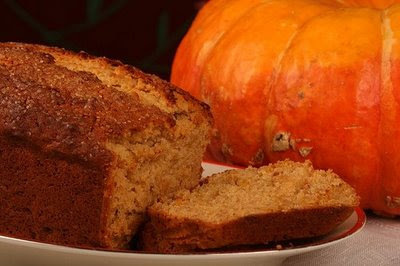 And yes, most pumpkin cake recipes use a cooked pumpkin purée, so this was different.